Conker loves posing for photos. Lovely picture, TT. A very peaceful and happy Christmas to you and all your "family". Merry Christmas, Drc .. Thank you .. The pebble garden has stayed looking good through its first autumn... not too many fallen leaves ! 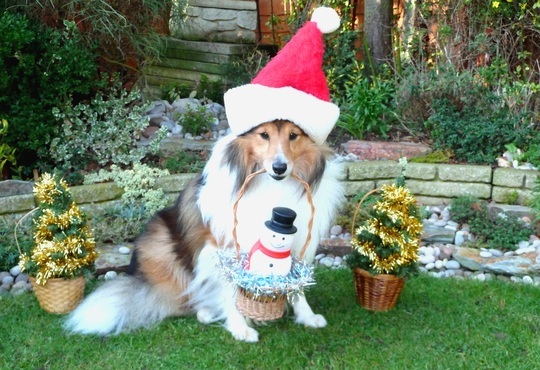 aw,bless him :o)..I hope you all have a lovely Christmas,Terra..and you still have that green grass ,and not white ! Lol. The only snow in the pic is the snowman... Lol. Hi Sue ... Thanks ..
Merry Christmas Tt to you and your family. Amy ... Extra rations ... ? ...Truffle won a cake for his birthday, coming up soon... for having the Waggiest Tail at a charity dog show back in the summer .... we are expecting the special doggie cake through the post this week ! Great pic - Merry Christmas to you and the boys! Thanks Pip, Jenni and Frances .. Thank you, Annella... Happy Christmas ..
A very Happy Christmas to you all TT, Conker, Truffle and Crocus. Not forgetting everyone on GOY, wishing all a very happy New Year in the garden. Love from Bob, Sylvia and Mrs. Tommy, snoozing happily. Hello Scottish .. many thanks..
Have a lovely Christmas ..
Great photo again, TT! :-)) I had to add it to my Favourites! When does Truffles get his photo shot? Hi Balcony ... Thank you ..
Ahh, it's so good to see you're basking in the sunshine - I've just got back from UK and have never known such ferocious cold winds .... brrrr. Yes, icy cold winds this week, but some sunshine too ..
Glad to know you're home safely from your travels. Delonix ... 'cooler than normal' ..
Lol ... it sure is ..
... snow is due overnight in parts of southern England.. !!! I hope you, Conker, Truffle and Crocus have a really happy time this Christmas Tt. Merry Christmas Terratoonie and all your fury/feathered family..Hope you have a great one! Wow! It's really feeling like Christmas, there. Typically, it's so warm here around Christmas, it never feels Christmasy! The last couple of weeks have been really chilly, with highs only around 65ºF/18ºC. Sorry to but in TT & Ba but have you seen the news about Bloomer?!! Merry Christmas TT....love the photo. Over Christmastime, Conker uses the little trees and snowman every day, as part of his trick routines..
Awww what a lovely photo TT. Happy holidays!!! Happy and healthy 2012 to you and yours. Merry Christmas Uma, to you and your family. Hi Conker, Nice to see you, How have you been...enjoyed your X-mas ..? Have a Happy New Year. Conker and his friends are well thanks. Just to wish you, TT & your four legged friends, not forgetting the feathered one either, a very happy New Year 2012.